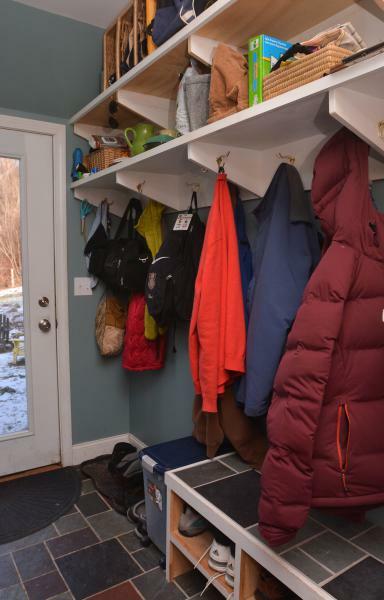 winter preparation - Northampton MA Realtors | Maple and Main Realty Agents paper, The Daily Hampshire Gazette, had this article to share, with great ideas about how to be ready for the snowfall when it finally comes. I imagine these items are flying off the shelves at local hardware stores, so put them on your shopping list if you don't already own them! Rock salt mixed with sand is the first thing that comes to mind for many people when the task is melting the ice beneath their feet. This is a perfectly acceptable solution for a limited number of applications, according to David Chaisson, co-owner of Stadler Ace Hardware in Belchertown. Maybe the bottom of a sloped driveway could use a sprinkling of this gritty concoction that provides the benefit of added traction along with its melting properties. It will give you the grip you need to build momentum as you ascend. But in most cases you'll want something a little less harsh. Rock salt is not only hard on metal, accelerating rust, but it also does no favors for concrete. In fact, "it will eat your concrete," said Chaisson. It may not seem like much at first, but the salt, which is perfectly fine on asphalt or blacktop, will start pitting a concrete walkway. Small cracks can develop and when water gets into those and freezes, the expansion will lead to a cascading cycle that will eventually destroy the concrete. Salt is also not great for shoes, it will burn your pet's feet, and if you track it into the house the carpets will suffer. The alternative is a product that comes under a variety of names but is usually referred to as Ice Melt. Chaisson carries a brand called Mr. Magic, which he prefers because it goes on orange, allowing for easy even distribution. "When you are putting it on the white snow you can see where you are putting it to get a nice even mix," Chaisson said, "so you are not putting it on too light or missing some spots." The active ingredient is calcium chloride. It keeps melting ice even when the overall temperature drops to minus 25 degrees Fahrenheit. That is considerably colder than rock salt, which only keeps melting down to minus 10 degrees. Chaisson recommends getting your Ice Melt early because it often sells out. Last year it was very hard to find by midwinter. Depending on your needs, the cheapest way of buying Ice Melt is in a 50-pound bag, though Chaisson recommends buying it in a drum the first time, and then buying refills. "It's always a good idea to have a drum or some kind of sealable container so you can do your job and then fill it back up," he said. "You have to cover it up and keep the moisture out because if the moisture gets in, it will make it hard as a rock and you have to break it up and it becomes a pain in the neck." Chaisson said you can apply Ice Melt on the ground before the snow falls or you can put it on ice that has already formed. "Let's say you have a thin layer of ice, you can put it down and it will stay there until the next storm," he said. "It keeps melting until it's melted out." How long that might be depends in part on how well the melted water drains off, or whether it puddles and refreezes. Driveways, walkways and paths to the wood pile are not the only places you want to think of in terms of keeping the snow and ice from piling up, Chaisson said. A little bit of early intervention when snow starts piling up on the roof can go a long way toward preventing bigger problems. Most importantly, he said, is to get the right kind of rake (with a long handle) so that you can clear snow off the first few feet of your roof. If you do that, the rest of the roof will take care of itself, as normal sunshine will heat up the shingles just enough to let the snow dissipate in an orderly way. Ice dams were an issue that people in our area used to deal with once in a decade, said Chaisson, but in recent years they have become an annual phenomenon. That is when ice builds up toward the bottom of the roof and stays there, preventing the melting snow from dripping off. In fact, it can build up and start pooling on the roof and then as it repeatedly melts and freezes it can seep under the shingles and over time cause major damage. "If it's looking like it's going to stay cold for a while, you should get a bit of your roof opened up even if there is not a lot of snow," said Chaisson. There is also a relatively new product that has come to the market in the last five years that looks something like a hockey puck that you can put on your roof to help keep the ice from building up. These are a little pricey, Chaisson said, but they work very well. "If your roof is frozen solid, especially your gutters, you can throw them up onto your roof a couple of feet," he said. "You don't have to be very accurate and you don't have to send them way up." The effect may seem to be almost imperceptible at first, but as the pucks (or discs) slowly melt the ice around them the chemical (just like the Ice Melt, it is calcium chloride) drips down with the water, clearing built-up ice along the way. "It may not look like it's doing a lot, but it is doing all the work under the top surface," said Chaisson. One of the reasons it is so important to clear the lower portion of the roof is that starting in the late afternoon the chilled air coming up can quickly freeze any moisture that gathers there during the day, Chaisson said. "The wind is what starts the thing because you are melting every day," he said. "Around 4 o'clock you get the uplifting cold." Back on the ground, ice is one thing, but snow measured in inches and sometimes feet can be another. Shovels come in at least 30 varieties and brands, ranging from less than $10 to up to $40. "You truly get what you pay for," Chaisson said. The major differences are between the "pushers" and the "lifters." There are also the so-called "back savers" which have angled posts that allow you to stay in a more upright position as you heave the snow to where you want it to go. The advantage is that you get to let your legs take some of the weight that your back would otherwise handle. Another variable to look for in shovels is whether the blade is made of metal or plastic. As you might expect, the metal blade is more durable but it might not be the right solution for a deck, for instance, where scratching could be an issue. And then there are snowblowers. Tom Perron, the owner of Boyden & Perron in Amherst, prefers to call them "snow throwers" but, he said, the terms are interchangeable and are usually dependent on who the manufacturer is. There is a lot of variety there. The simplest power tool for clearing your front steps and maybe a walkway or small driveway is a power shovel, which is electric and plugs into the wall. An obvious advantage is that you don't have to deal with smelly gas and oil. There are also no spark plugs or carburetors that need to be serviced. Besides being clean, they are also light, so you can easily take them out to a deck you want to clear. The obvious down side is that you have to be within reach of a power source and you have to manage the cord while you are doing your work. Perron sells three sizes of power shovels. When it comes to gasoline-powered snow throwers, there is a major distinction between single-stage machines and double-stage machines. For the first, the auger (think spiral blade) touches the ground directly. As it spins it throws the snow off to the side. This is good when you are working on smooth surfaces and the snow is not too deep or tightly packed. The motion of the blade helps propel the machine forward as you go. Depending on use, the blade needs to be replaced every few years. It can throw the snow 25 to 30 feet, according to Perron. He sells these in seven different models. For bigger jobs you will want a two-stage snow thrower. In this case the auger does not touch the ground, which means you can use it on a wider variety of surfaces, including rougher terrain like a lawn or a gravel driveway. The rotating blade in this case cuts into the snow and feeds it to a secondary mechanism, called the impeller, which is what throws the white stuff up to 40 feet. Unlike the single-stage snow thrower, this machine has a transmission, which means that you can adjust the power depending on the job. The wheels are also connected to the transmission so you get a power assist in moving the machine forward. "Some of the larger snow throwers are easier to use than the smaller ones," Perron said. He sells seven models of the two-stage snow throwers. Those at the higher end include features like heated handles and headlights as well as, of course, more power and a wider intake so you can move more volume more quickly. Finally, if you want to go really large, there are riding snow throwers. These are for people who have large surfaces they need to clear quickly. The added benefit of these is that they have a dual use as lawn mowers in the summer. That is something nice to think about as you head out into the frigid environs of a heavy blanket of snow left behind by a winter storm.